World’s most popular mobile operating system Android has also some drawbacks and short battery life is one of them. If you use all the major features of your android smart phone, you will be surprised to see that your battery barely lasts for a day. It is definitely a big issue for a lots of Android users.Today we would like to share a list of ways to improve your android phone’s battery life. 1. Your phone display is the one of the major battery juicer. If you want to get rid of this problem, always use the “Auto Brightness’ feature on your Android phone and believe me it will eventually help you to improve battery life. To turn on this feature on your phone go to phone settings –> display-> brightness –> tick “automatic brightness”. 2. Always turn off wi-fi, GPS and Bluetooth when they are not in use. By disabling these features, you can easily extend your battery life. If your WiFi is on, your android phone will consume battery by searching networks automatically. It does not matter whether it is connected to a network or not. 3. Don’t use live wallpapers on your phone screen and also remove widgets like weather, news, live feeds etc. from your home screen to improve your android phone battery life. 4. Set your screen timeout to the shortest length will also help you to save battery power. 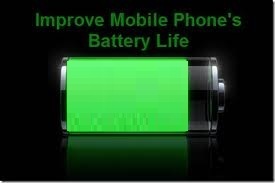 The shorter the duration, the less battery power your screen will use. 5. If possible turn off vibration. Setting your ringtone to ‘Ring and Vibrate’ consumes a lot of power.So, try to keep your phone in ringing mode or in silent mode to improve your android phone’s battery life. 6. If you rarely use internet on your android phone then tell your android to use only 2G mobile networks other than 3G. You can force your android phone to use 2G network by go to settings –> mobile network settings –> tick “use only 2G network”. 7. You may be unaware that keeping your phone in a warm place can reduce its battery life. So, try to Avoid placing your phone in warm places like near a sunny window.